The smiles, hope and renewed confidence that result from receiving a Helping Hands Grant is the reason that Care for Others exists. The generosity of our donors, the skilled work provided by our volunteers, and the return to security for our families in need provide the inspiration for a bright future. The gifts from our donors bridge the gap between independence and need. In turn, the return to independence of our recipients sustains our faith in the power of a simple hand reaching into the darkness of despair and lifting another into the light of hope. This is how we Care for Others. Take a moment to see how your generosity has helped by clicking a Grant Recipient on the left. Care For Others most recent grant recipient, Joseph Yakimow, from Lakewood, Ohio, received a "Helping Hands Grant" to purchase an iPhone and application called Proloque2go. After fighting several battles with cancer, along with multiple surgeries, Joseph was left unable to verbally communicate. Through the Proloque2go application he is now able to send text messages, as well as pre-program phrases and sentences that the iPhone relays through a digital voice. 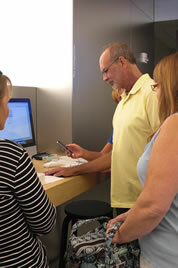 Joseph is pictured to the left learning to use the application and iPhone along with his wife, Millissa and Care For Others' Secretary Laura DiLella. Be sure to read testimonials from our grant recipients.